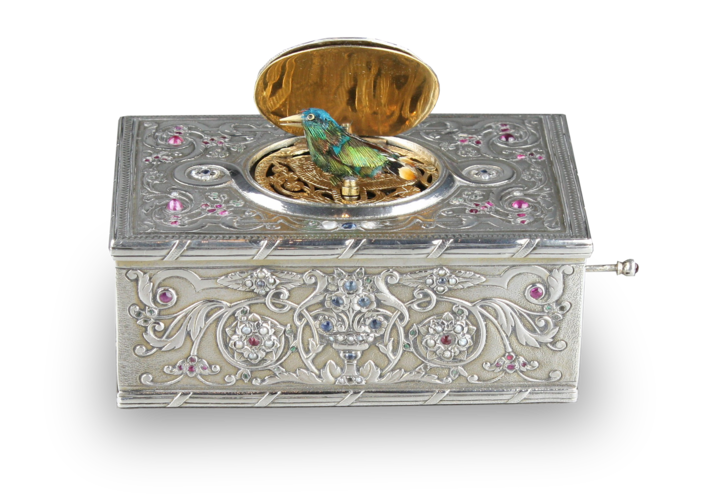 When wound and the start/stop pull actuated, the bird emerges triumphantly through the finely detailed bird-form tooled gilt grille, moving tapered polished metal beak, wings, tailfeather and body from side-to-side to continuous birdsong. 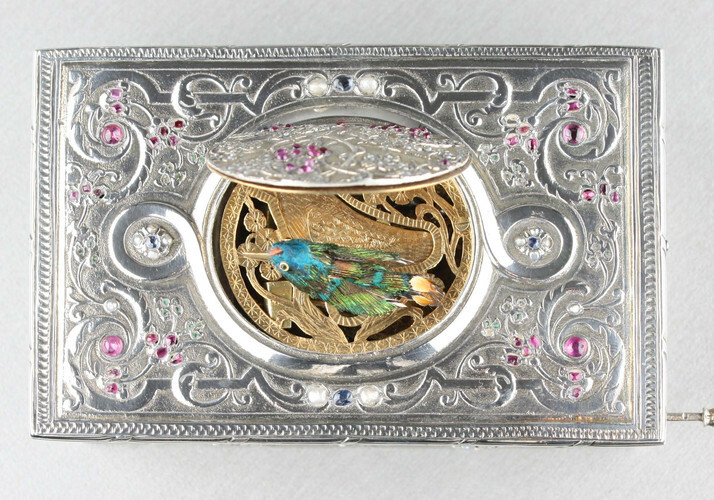 The bird with naturalistic shaded feathered plumage with multiple colours including blue, light brown, and black, cleverly accompanied with iridescent highlights in gold, green and orange, the pierced grille with tooled flower radials and bird feathering to solid centrum, surmounted within cross frieze key border, in extraordinary case of tooled and chased silver with relief to bird lid of vine berries picked out in red hardstones, against teal blue drops and pearl leaf accents, with vine twists against pitted ground, triptych knot with small returns to main lid having pearl set flower centres, complex branch and vine trailing matrix with further berries and flower blues with shepherd's crook unions terminating with double pearl bosses, tooled zip frieze frame, the theme continuing to all sides with central urns having blue stone arrangements flanked by double flowerhead bosses and ribbon pole friezes to top and bottom fields, underside with plain field retaining gilt hue, start/stop pull to right-hand side with cup finial, finished with the last red stone as its centre. 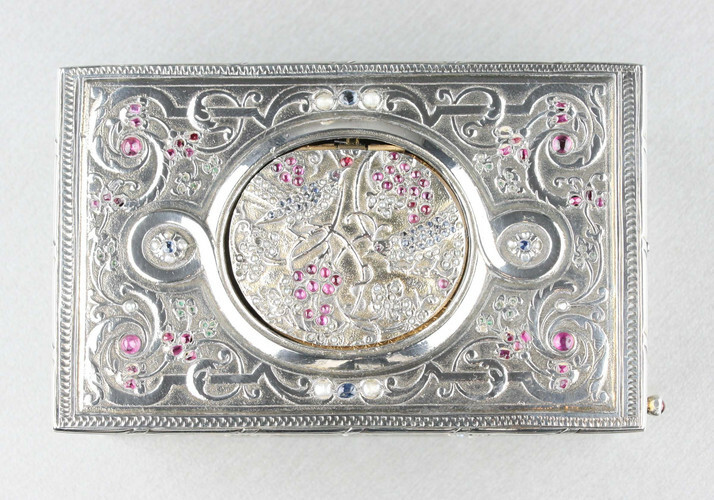 This very exciting antique case displays unusual features which reveal the specialist techniques of the fine silversmith. 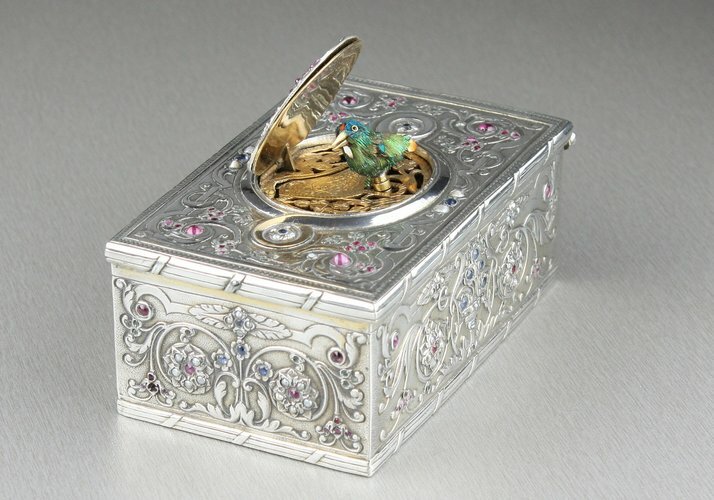 The mounting of each of the hardstones has been achieved by piercing through the case, with the stone held like a section of stained glass. 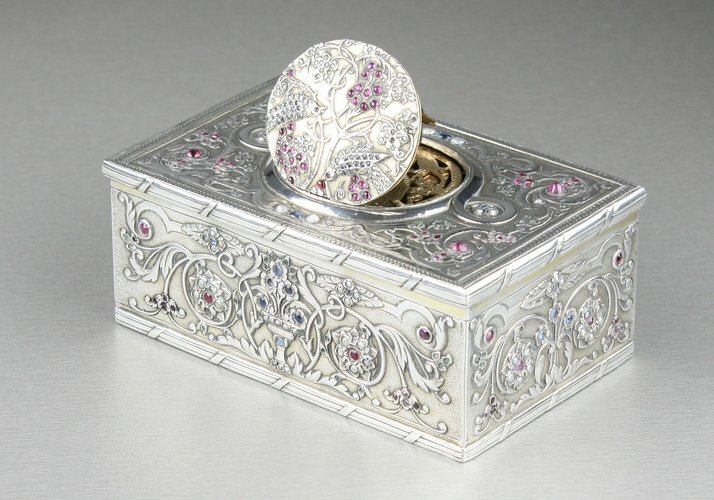 No foil backing or other colour enhancements have been used - instead taking an advantage of the natural true colour of the stones. 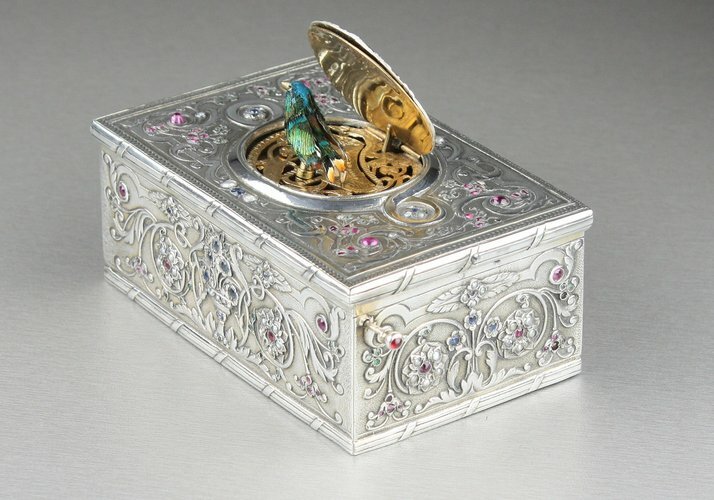 This creates an interesting situation, as once the lid panel and the movement is removed, one can enjoy holding the case and lid to the light and see the colours lit up brightly. And due to their natural state, all same stone colours differ slightly. 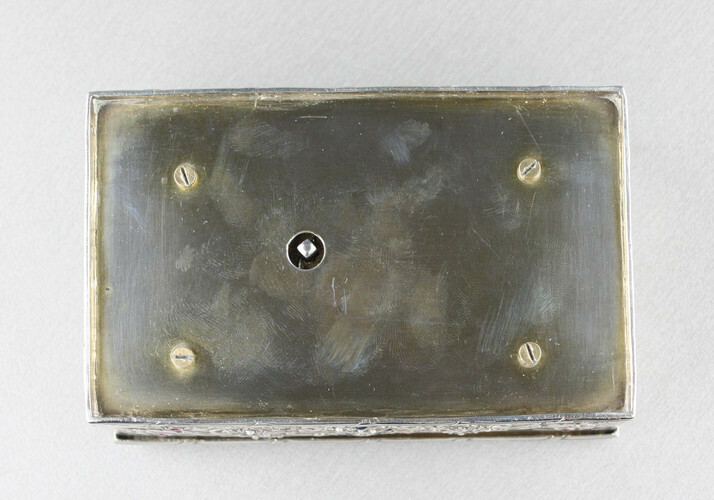 This method increases the depth of the stones, with a dark deep void behind when this bird box is assembled making each stone appear soft and natural. 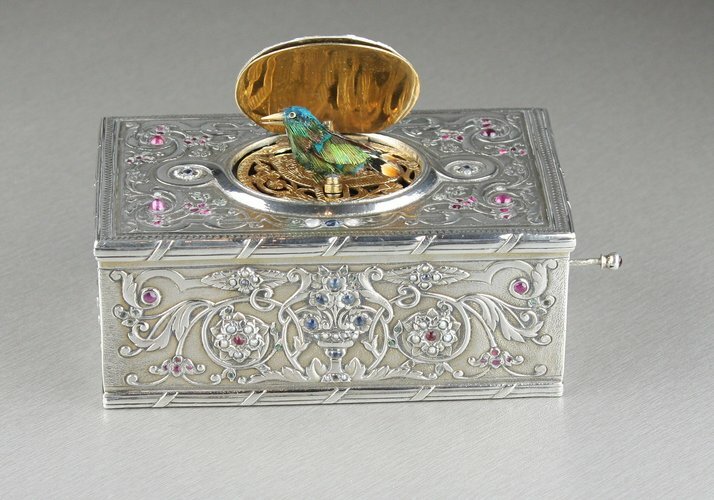 The important period of the 1910s brought us designs which took us closer to natural form and beauty - an asset very much at the heart of the design brief with this case.